Warning: You may not find this stuff really interesting, unless you're already interested. It's technical stuff. 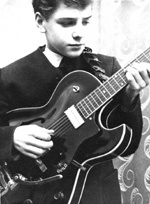 "The guitar system I have put together over the years has developed out of a continuing search for a guitar sound which can always be better and sometimes can just be different. When guitar effects started to become more than just a wah wah and a fuzz box; the sound got worse. Each time a new effect is added you hear the effect but you also hear the quality of the sound start to degenerate. 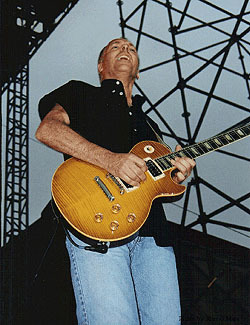 What happened to that sound, I remember, when playing a Gibson through an early 60’s Marshall 50 watt? A guitar with a great sound right into the perfect valve amp - nothing like it! I wanted that sound while adding effects on top without losing any sound quality at all. In order to achieve this you must completely bypass the effects when not in use and bring back any delays or echoes just like you would the echo returns on a mixing console. In essence, any effect I add is just that - an addition to the pure sound of the guitar straight into the amp. Bob Bradshaw, CEO of Custom Audio Electronics, has been designing and building this kind of system for years, and has come up with a way of switching effects and signal paths while at the same time being programmable. So, this is a description, or my interpretation of how this system works. I know how to get the sound and I understand the theory behind it, but that’s as far as I can understand - electronically! Talk - You’ll have to guess this one! The picture above is a template of the pedal board from which I control the system . Each switch is either a choice of amplifier or effect. I have a CAE 3+ pre-amp and a Marshall 100 watt as my choice of pre-amplifiers, and I also have a Leslie rotating speaker cabinet which is better known for it’s use with the Hammond organ. I first saw a Leslie speaker being used for guitar when in the early seventies, I supported the band Poco quite a few times and Rusty Young who is a great pedal steel player was using one exclusively. What an unbelievable sound! It is the ultimate chorus effect which inspired the invention of all the choral and flanging effects of today ( and there’ll be more tomorrow! ). 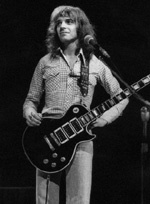 On 'Frampton Comes Alive' you can hear the Leslie sound as the speed changes from slow to fast. 'Do You Feel' is a good example to check out, also ‘Go To The Sun’. I do use the Leslie all the time but on these tracks it is easier to recognize. Those effects that are midi controlled can be programmed from the pedal board. so for every bank, of which there are 22, there are also 6 presets. For my own show I look at it as one bank per song. Therefore I have 6 different programmable combinations of amps and effects for that song or tune. The reason for using a bank per song is that the delay times are all different as every song varies in speed. The verse might need a clean sound and the chorus a more dirty one and then perhaps a really filthy one for the solo!" "The first effects that the guitar sees are an lbanez tube screamer, then a Mutron octave divider that gives you an octave down in combination with the note you are playing. I have a reissue MXR Phase 90 and an old Foxx Tone distortion giving you an octave above as well as the note you are playing. Next, the guitar sees the input of either of the two pre-amplifiers. The CAE pre amp has a clean, a crunch and a lead channel combined with the Marshall for most solo sounds. There is a total of four different basic sounds. 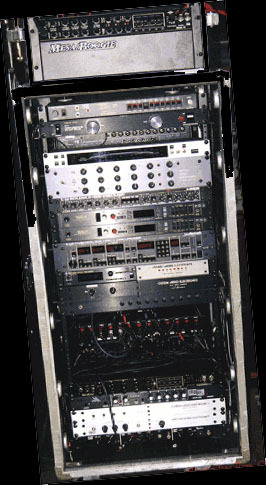 The Marshall and C.A.E.+ preamps send the signal to the effects units. 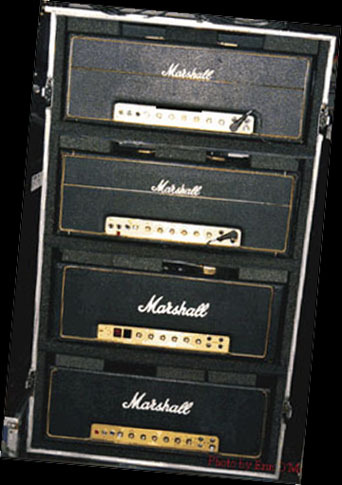 The output from theses effects return to two Marshall 100 watt amplifiers where just the power or output section is used to send the signal to the left and right Marshall 4 x 12 speaker cabinets. If that wasn’t confusing enough there’s more! So now you have all the vari- ous effects coming back to a stereo pair of speakers. But, where’s the dry normal sound go? Well, my fight over the years has been to be able to keep that wonderful sound of ‘A GUITAR’ plugged straight into ‘A GUITAR AMPLIFER’ with no effects to degrade the sound, PLUS having the added luxury of all the effects you want on top. So you may have these bonus sounds in addition to the sound you worked so hard to get in the first place. Wow, did you get that? Now the original, dry sounds from the front ends or pre-amplifer sections of both the C.A.E.+ and the Marshall go straight to the power section of the same Marshall and right into another 4 x 12 Speaker cabinet. So there are three cabinets. The center is the dry and the two outside cabinets are the wet or effected stereo returns of all the effects. There is one more amplifier in a rack with the other three, which is a 70’s, 50 watt Marshall that is the designated amp for the ‘TALK BOX’ ( originally made and given to me by Bob Heil of Hell Sound in Michigan - Jim Dunlop now supplies them and there is talk of a Frampton model! ). Now you have a basic picture, I hope, of what Bob Bradshaw of C.A.E. and myself have come up with over the last decade plus. Bob is continually working to improve signal quality and there’s always something new to try and I usually let him try it!!!! Thanks Bob and all at Custom Audio Elec- tronics in being there to help in the search for the ‘Holy Grail’ of guitar sounds which, of course, will never be found. But the search is where lies the fun and excitement to inspire one to play new and different things. Having said that, a Les Paul or Strat plugged straight into an old Fender, Marshall or Vox (etc., etc.,) amplifier is, for me, a sound that will always be hard to beat!"